Learn Martha's no-fuss, archival method of machine applique, which achieves the look and feel of hand applique. These cute simple little baskets are perfect for learning her machine applique method. Purchase the kit to make the 22" x 27" quilt, which includes all of the fabric needed to complete the quilt top and binding, or bring your own. Mettler 60/2 thread colors, listed in the class supply requirements, are to coordinate with the fabrics in the kit. 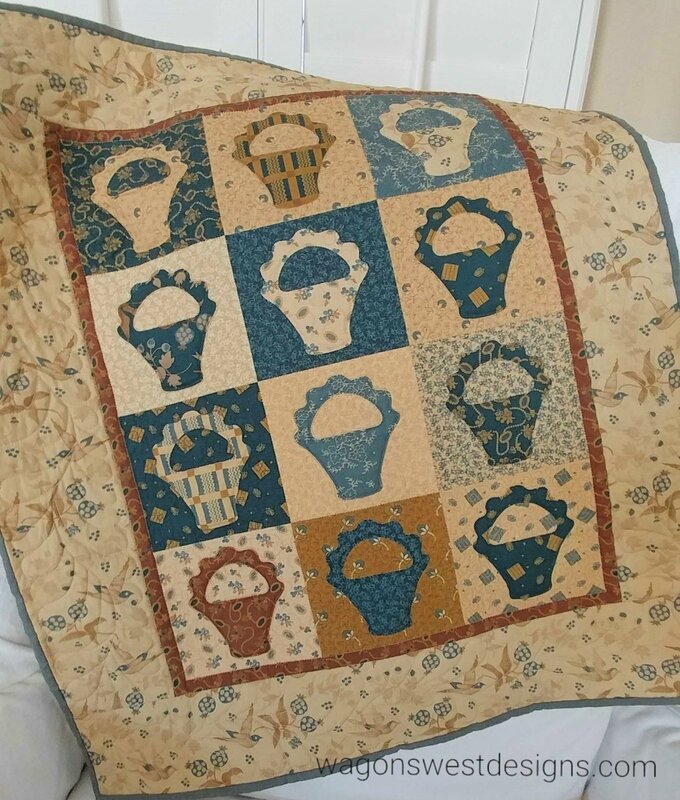 If bringing your own fabrics, bring Mettler 60/2 threads to match your basket appliques. Porch Perfect: Baskets in Blue pattern by Martha Walker for Wagons West Designs included in class tuition. Pattern provided, pattern templates.. A class supply list will be emailed to students upon full payment. Some supplies (while supplies last) are available at Wagons West Quilt Shop & Studio. Kit available to make Baskets in Blue, as pictured, but not required. A solid understanding of the operation of your personal sewing machine is a must. Your sewing machine MUST have a blind hem stitch in order to utilize this technique. Your machine must also allow you to adjust the stitch width and stitch length down to 0. Although not mandatory, an open toe embroidery foot is HIGHLY recommended for greater visibility in your stitching. Bring to class your owner's manual, a zig-zag needle plate, a zig-zag foot, a straight stitch needle plate, 1/4" patchwork foot, and all other sewing machine feel you may have.